Part 2: Why Qur'an is Revealed? Is it such a Message that you would hold in light esteem? The Muslims around the world are gravely misguided and deceived from causes both from inside and outside. The reason is very simple. 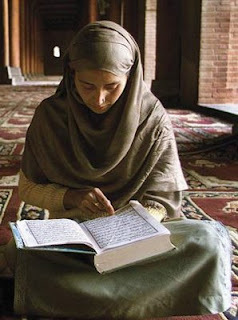 It is because the very Guidance, the very Constitution of Life's Transaction, the Book of Divine Law and Criteria, the very Light they were given, it is that Qur'an the Muslims have abandoned. They have replaced Law Given by God and His Messenger, with Law influenced by Interest Lobby Group and their Paid Prostitute Law Makers in Congress, in Parliament and Filthy Politics of Money and Corruption. This is nothing but blasphemy and betrayal to God and His Messenger. The Prophet very clearly left instruction to hold tight to Qur'an and yet the leaders of Muslim nations who have been trained and brain washed and deceived by the Colonialists for the sake of control have again brainwashed the common people to reduce the Qur'an as a thing of religious entertainment, as thing of decoration at their houses wrapped in clothes, as a thing of competition for who can babble it batter, as means to organize chanting competition - everything except their Inspiration and Aspiration for this world and the next, everything except their Guidance for Society, everything except their Source of guided life. The Prophet himself warned us that a time will come when the scholars of religion will be the worst people under the sky will be those who claim to be scholars of religion. We are on the cusp of arriving in those times and the ominous signs are starting to show. To the author of this article, the so called Muslim scholars of religion who still insist that 'its Ok not to understand the Qur'an' or downplay the critical importance of understanding the Command and Prohibition, the Limits, the Advice, the Examples and Parables, the Instruction from God - it is these scholar who are playing ignorance, who champion ignorance, who are exact opposite to everything the Prophet stood for. They forget and betray the spirit of knowledge and wisdom of the Prophet out of which he said about almost 1400 years ago that "knowledge is compulsory for both men and women." The educated Muslims around the world has a great responsibility to return back to the Qur'an, to regularly study it in their own language to understand what Allah wishes people to know, to read it cover to cover, again and again, to understand and ponder its meaning, then also understand it in the very language in which it was sent, for many words are mistranslated and classic Arabic is such that the same word depending on the context can have many variety of meanings. There needs to be a strategy for Muslims, specially non-Arab Muslim who are about 90% of the Muslim population to again create bond and relationship with the Book of Allah and the starting of this strategy is to read this Book Cover to Cover in their own language. This can be a life changing experience provided that the Qur'an is approached with care, love, respect and honor. Great scholar and a saint of Islam, Mevlana Rumi said the following (translated by William C. Chittick) which is very true about the Qur'an which is a dynamically alive Book that reveal its many dimension meaning only to those who approach it with care, love, respect and honor. May Allah unveil the Qur'an to us and may its rays of Nur illuminate our Hearts and may Allah help us to increase our Love for the Qur'an as a token of our Love for Allah and His Messenger. May Allah unveil the Qur'an to us and may its illumination illuminate our Hearts and may Allah help us to increase our Love for the Qur'an as a token of our Love for Allah and His Messenger.